Due to circumstances beyond our control, we have had to postpone this event until later on in the year. We enjoyed an excellent response from our visitors and would like to apologize sincerely to our customers who were looking forward to this event over the Easter holidays. Ticket holders are being contacted by our Events Officer directly, if you have purchased a ticket and have not received any communication by Friday 30th please get in touch here . Once again we would like to express our most sincere apology for having to postpone this event, but we will be releasing new dates on our website soon. Thank you for supporting Sacrewell and the William Scott Abbott Trust. 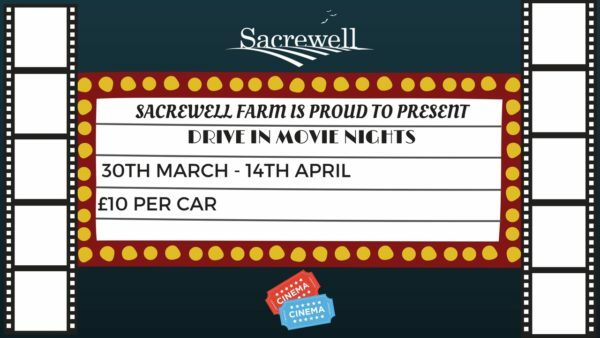 Come along to our first ever Drive in Movie Nights this Easter! Experience this unique cinematic experience and enjoy some family favourite films from March 30th – April 14th. Below is our full list for our 11 nights of films. £10 per car (advance booking only). Snacks and drinks will be available to purchase on site. All movies have a start time of 8pm.